Showing results for tags 'rwby'. [Team RWBY] Are you combat ready? “I’ll...keep this brief. You have traveled here today in search of knowledge--to hone your craft and acquire new skills. And when you have finished, you plan to dedicate your life to the protection of the people. But I look amongst you, and all I see is wasted energy, in need of purpose – direction. You assume knowledge will free you of this, but your time at this school will prove that knowledge can only carry you so far. It is up to you to take the first step. ” Team RWBY is looking for Huntsmen and Huntresses who are willing to risk it all for the good of Human and Faunus alike… or people who just want to play video games and talk RWBY. If you have any questions about joining, our Discord is open to all. https://discord.gg/Frdu2gS Feel free to stop by and talk Warships, RWBY, Anime, or really anything. Fair warning, if you bring up Star Wars there will be a 30 minute discussion about why you are wrong/right. 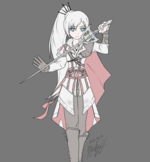 Team RWBY Team RWBY started out as a group of casual players with an interest in both RWBY and warships. Most of our members are average players, looking for a community that is active and willing to help, if need be. While we will give it our best in Clan Battles, we like to take it easy in the off season. We made it into the Storm League this season, and will make Typhoon League next Season. Team JNPR With the number of RWBY fans it became apparent that more space was needed. Team JNPR is a small clan that joined us and now we are helping them grow. As of now, JNPR is open to all to join. We would still like to compete in Clan Battles, so Tier 8s would be appreciated. “So you want to come to my school?... Well, okay.” Classes I hope you were not just expecting to sail and shoot ships all day. You will be tested, and your skills evaluated. However, you should get to know your Professors and fellow Students. Headmaster/Commander The Headmaster is in charge. Professor/Deputy Commanders Professors help run the clan and will be in charge of sub-clans. Professor’s Aide/Recruiters Teacher’s Aides are to promote the clan on different forms and websites. Student 1st year Everybody has to start somewhere. Student 2nd year 500 Random Battles - Win Rate of 45% - Avg. Damage of 20,000 Student 3rd year 1000 Random Battles - Win Rate of 47.5% - Avg. Damage of 25,000 - One Tier 8 Tech Tree Ship Student 4th year 2000 Random Battles - Win Rate of 50% - Avg. Damage of 35,000 - One Tier 10 Tech Tree Ship Alumni 3500 Random Battles - Win Rate of 55% - Avg. Damage of 50,000 - One Tier 10 Ship of each Class Huntsmen/Huntresses 7500 Random Battles - Win Rate of 60% - Avg. Damage of 60,000 - ALL Tier 10 Ships in the Game Exchange Student/non-member How to Join Team RWBY is open to all players who are active World of Warships players. Requirements to join Team RWBY 1000 Random Battles Two Tier 8 ships, one of them being a Tech Tree ship Exceptions can be made. Requirements to join Team JNPR 45% win rate 500 Random Battles One Tier 8 ship Both clans need active players to grow. If you are inactive for 60 days you will be kicked. Life can happen, so if you are going to be gone for some time please message a Professor and let them know. Well, I’m not sure how to end this... so I’ll just leave it to Neo.